I started using Speedplay pedals back in 2006. I wrote a first review in 2008. This is an updated review after using them for nearly nine year. Speedplay pedals are very good to ride on. They took a little bit of getting used to (like floating on ice is common feeling), but now I don’t want to go to any other system. They are light, small and easy to use. I’ve never had any problems when actually cycling with them, and since pedalling is so important, this makes me want to like them and overcome any faults they may have. 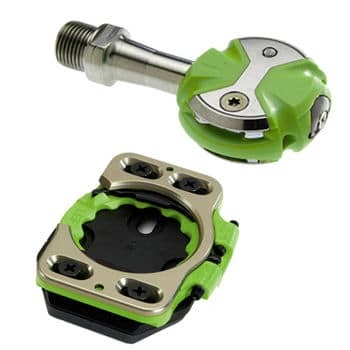 The main drawback of Speedplay pedals is that they have been an expensive choice. In particular, they are more prone to long-term maintenance problems. Three times I’ve had to throw away a pair because the internal bearings seized up (it was always the left pedal which went. So I have three spare right pedals lying around). 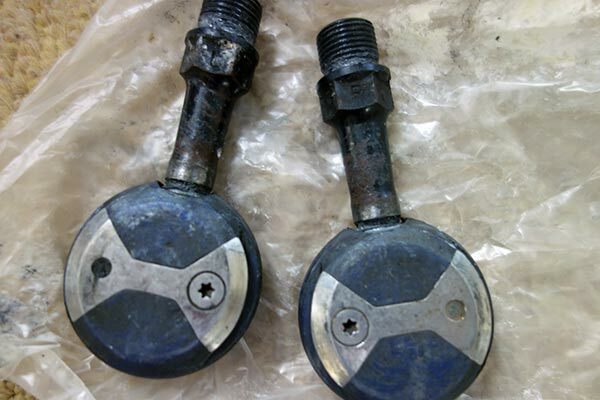 I once complained to Speedplay and someone from America rang up to say they never get maintainance problems if you look after them and pursue regular maintenance – using grease gun and lube. I was dissappointed I couldn’t buy a spare left hand pedal to match up my surplus right pedals. If you do buy Speedplay, it is really essential, you learn to grease and lube regularly; I wish I had done earlier. Very aerodynamic – pedal is small surface area. Cleats are easy to set up. I always found the Look cleats a bit fiddly to get in the right position. If they were slightly out, it could cause problems. Speedplay are much easier to set up because of the greater degree of lateral movement. Optimal power transference because pedal is encased in shoe with minimal stack height. Whether, there actually is better power transfer, I don’t know. But, it does feel good. I have been very happy with the Speedplay X. They are definitely a little strange when you first test them. But, it is amazing how quickly you can get used to the large float. Cycling with speedplay feels very natural. Some might feel the large degree of float makes it harder when sprinting. The Speedplay Zero, are essentially the same as the X series, but you can control the amount of float, offering more adjustability than the Zero, which are always set to maximum float. With the X, I always end up brushing against the side of the cranks. It means my cranks look polished (removing any decals). Also I wear through overshoes very quickly. The two series are not interchangeable, which is a bit of a pain. Since I started with X, I don’t want to make the transfer because it would be too expensive. But, if I could start again, I would choose the Zero series. With Zero, Speedplay suggest one option is to use the ‘Heel-In’ adjuster so that it didn’t hit the chainstay and to open the ‘Heel-Out’ to the full float. I have to say, I’ve never used the micro adjuster, but it makes sense to prevent heel hitting chainstay. 1. Cleats Expensive The X Cleats are expensive to replace. £31 at wiggle. I think these are the most expensive cleats. To be fair they do last a long time. I’ve had to replace about three times in six years. I try and avoid walking on cleats, but I find that it is the metal spring in the cleat which wears away first. 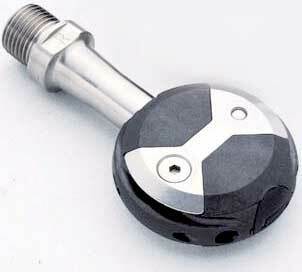 Speedplay are unique in having the attachment mechanism in the cleat itself rather than the pedal. Hence why they are expensive. On this occasion the pedal got stuck in the cleat. 2. Bearing System. Speedplay say that they deliberately choose a more fiddly system to get better performance. They use three bearings and it needs more maintenance than standard pedals. But, they claim the cost of extra maintenance enables them to get a better performance. Because the bearings are more prone to have problems you need to do two things. It doesn’t have to be quite as messy as this. But, you do need to get your hands dirty and grease the pedal regularly. Grease at regular intervals. This means using a grease gun and squeezing in grease into the centre of the pedal. Lube the pedal in between greasing. 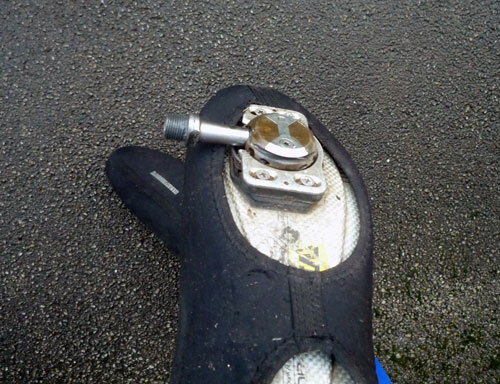 When it’s wet, it’s advisable to put lube into pedal and also squirt a bit on cleat. Dual sided entry is good. Easy to get in and dismount. Never had any real problems either getting in or out. Though if you get mud on your shoes, it can become difficult until you get rid of the surplus mud. I once bought the coffee cleats, but found it required too much effort to remember to bring them and use them. They remained largely unused. Very good clearance. Also, they have a low stack height, this means the shoes is closer to the pedal that many other pedal types. 206g total weight. (The titanium pair are 150grams) I use the Titanium pair for racing and the stainless steel for ordinary riding. After losing a few speedplay pedals to ceasing up, I bought the cheapest Cromoly pedals, they are only a few grams heavier, but nearly £40 cheaper. The main advantage of the Stainless steel over the Chromoly is that they look better over time. After a winter’s use, they do look a little battered, the Stainless steel look better. But, for winter training bike, you don’t worry about the shiny polish on your pedals. 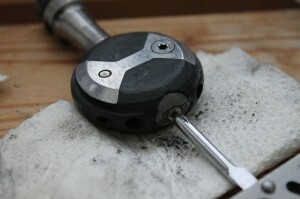 Speedplay pedals need careful attention. These are the essential maintenance tips for Speedplays, I wish I had followed these from the first time I bought them. It has been expensive not following maintenance procedures. A grease gun, and grease. Speedplay have an expensive specific grease gun at Wiggle (£39) surprise Speedplay is expensive! I bought a speedplay specific grease gun and Speedplay grease lube, but you might be able to do the job with just a normal grease gun. 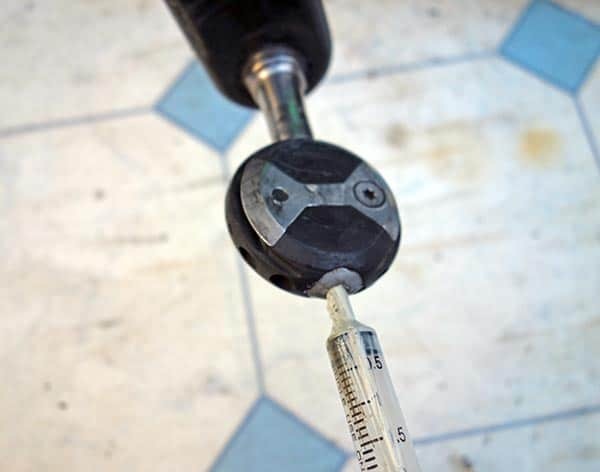 Alternatively use a 5ml syringe, which is perfect for fitting into the pedal and use a small tube of grease for refilling the syringe. 1. Remove screw from outside of pedal. This is where you squirt the grease in. Now comes the fun part. 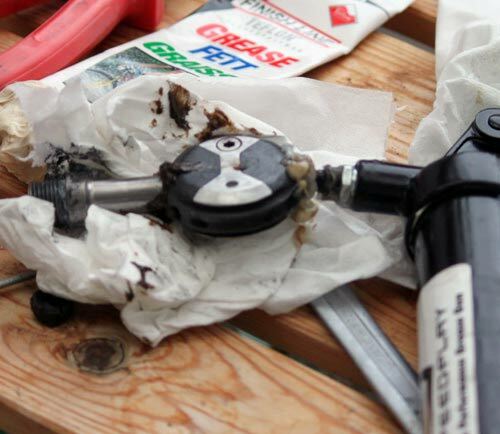 With a grease gun, force the grease through the pedal. This was hard work, you need to keep the grease gun held against the pedal. I found a lot came out the wrong side. Eventually, you should see some dark dirty grease coming out the other side. This is somehow very satisfying and makes you to start enjoying the job. When the thick dirt grease stops coming out, that means you have filled pedal with nice new fresh grease. Now the pedal should spin without friction. They should be some resistance from the grease like liquid. It’s quite nice to have a pedal which is now spinning properly. 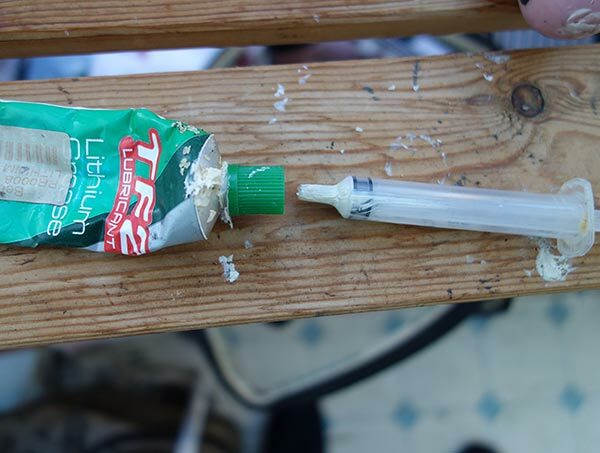 After wet or muddy rides, Speedplay advise adding lube to the pedals. They don’t advise using wet lube like GT-40 because they attract dirt. They have a specific SP lube – which they say dries quickly. Unlike most speedplay products, it’s not too expensive $6. But, you should get the same results from a similar dry lube. I find it is less important to lube the cleats, but, if they get stiff or after a very wet series of rides, it’s good to use some lube one the metal clip. It’s easy to have a bit of a love hate relationship with Speedplay. When they are good, they are very good. When they’re bad, they are very bad. If you want low cost, low maintenance bike equipment, I strongly advise against Speedplay. If you want the best pedals and don’t mind paying the cost and undertaking the necessary maintenance – Speedplay may be the best choice. Pedal choice has always been a personal issue, and it’s worth trying to test out pedals and see which work for you. Yes, I’ve committed to the Speedplay option because in many ways it works for me, and I’m reluctant to start switching over to a new system. I complain about the price of buying new pedals, but it just makes me more determined to apply the necessary maintenance schedule. Which is better X or Zero? Again, because I started with the X (full float) it never made financial sense to switch to zeroes. However, if I started again, I might prefer the Zeros because I would limit the amount of float inwards to stop shoes hitting chainstay. I have only just changed to speedplay. Mainly for crits as I could often take a while to get clipped in on my Look pedals and quickly go from starting at the front to being at the back of the pack by the first corner. So far I’m happy – after limiting the crazy amount of float you get. Good call on the maintenance. Cheers! I got the Speedplay Zero Chromoly after your great review because I have had knee problems with Shimano 105/Ultegra road pedal since I felt locked in. So I have no trouble clipping in and out of the Speedplays, but I find that when cycling uphill, I feel that the pedals are slipping and I end up using the weaker/wrong muscles to cycle uphill as compared to my previous Shimano 105/Ultegra road pedal. I almost want to switch back to my old pedals. Do you think it’s just a matter of getting used to the Speedplay, or just dialing down the float? If I dial down the float, then it would negate the benefit of using Speedplays in the first place. Thanks for any advice you have. I have three pairs of Speedplay pedals all with the left pedal needle bearings worn out, the right pedal is perfect. They have been lying around for several years annoying me with their 50% usefulness. I decided to take them apart to see if there was anything I could do with them. I took the bow ties off and swapped the left pedal clip inserts with the right pedal clip inserts. I had to install them back to front in the pedal body to match the left cleat arrangement. Now I have a perfect pair of working pedals made up of two right pedal bodies. I also have two pairs or speedplay pedals with the left pedal needle bearing worn out. Why is it that the left pedals wear out first? I wish I knew. Speedplay deny it is an issue and won’t sell individual pedals. My last pedals were clip-less mid-1980s Mavics. Basically, they looked (pun intended) just like LOOK pedals of that same era. Anyway, I just got the Speedplay Ultra Light Action pedals and WOW, the massive amounts of float truly feels like I am skating on ice (i.e., your “like floating on ice is common feeling” comment is spot on!). So, I Googled and Googled and even talked with the Speedplay people. They are very nice and said essentially the same thing you did — it just takes a bit of time to get used to the float. Have you tried relubing the seized pedals? I once had my other side Speedplay Zero Stainless seize on me.. I however pushed new superlubes trough the pedal and it has been fine ever since..
Hello, I am in AZ and also have speedplay x5 pedals which I love. I do not race but really enjoy cycling for fitness since I am unable to run. My cleats are fine but I need a new right pedal. Would you be willing to sell me a right x5 pedal? I live in upstate NY, with plenty of notoriously crappy winter weather, and tons of road salt & sand, and my Speedplay pedals have held up remarkably well. I lube about every 10,000 miles (I have over 30K on one pair, and they still spin like new), but I check them regularly to be sure there’s no grit or grind. I started on zero’s with stainless spindles, and have subsequently upgraded to Pave’s becuase of their additional durability on the wearing surfaces. With zero’s I wore down the outside edge of the “lollipop” which is made of plastic, and resulted in my foot rocking slightly (about 1 or 2 degrees, but still annoying). 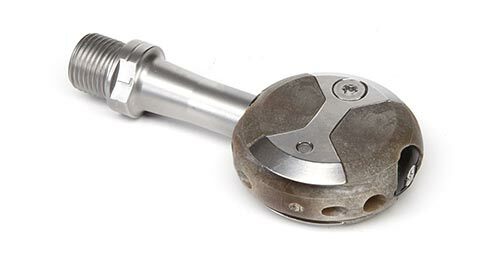 Eventually that led to some minor knee issues, and thus, the change to the pave’s, which are all forged stainless steel on the bearing surfaces of the pedal. s noted, 30k later, no problems. I now own 3 pair – one on each bike (I know, I’m lazy). Yes, they are expensive, but they are worth every penny IMO– I love them and will never ride anything else! when i tried to grease my speedplays using the 5 cc syringe, most of the grease just came out around the cap and in fact the popped up a bit. am i doing something wrong?? That can happen. I would try put downward pressure as you put grease into cap. I love my speedplays. I’ve had the same set of pedals for 11 years (although 4 years of that the bike was in storage). I’ve ridden thousands of miles in that time. Not a single issue. I’ve never even greased them once. I’ve taken my bike in 4 times for a service over that period of time, so perhaps they greased the pedals then? Not an issue either way. I’m just now looking at maybe upgrading as the top (surface) layer of the cleats have almost worn away, and I think they might be about to fall apart.